Going about five blocks south of Met Foods for the first Snapshot of this group. 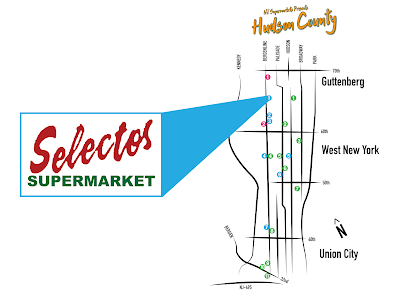 Similar to the little International Supermarket in Elizabeth is this tiny Selectos Supermarket right in the main business corridor of northern West New York (WNY), NJ. This one is looking pretty good with a real brick facade, new sign and awning, and bright colors in the windows. I did not go inside, but it's a very small 2-3 aisle store that used to operate as La Marqueta Meat & Produce, and before that El Colmadon Grocery. I don't know if any ownership changed there. I've already talked about how the furthest-behind supermarket group around here is Metropolitan City Foods, a division of Associated Supermarket Group that runs Met Foods and Pioneer Supermarkets stores. I won't go into that too much here, but this store is typical of an outdated MCF location. It's the farthest north on our tour and the only one in tiny Guttenberg. On Bergenline Ave between 68th and 69th Streets, the nicest thing about this supermarket is its awning. Not sure about the spelling of "pinacle". If they mean the highest point, then it should be "pinnacle". I doubt it's someone's name, but I could be wrong. It's a surprisingly non-Hispanic store in this very Hispanic neighborhood. The hot food bar is more of the meatloaf and mac & cheese persuasion than arroz con pollo and carne asada. You walk in on the left side to the dairy aisle, strangely enough, and the back wall contains hot food, deli, meat, and seafood. Frozen foods are in the last aisle and a tiny produce department is jammed up into the front corner. The inside is your typical urban ethnic supermarket, except not ethnic. It was not particularly new, clean, or organized, but the one employee I interacted with was very friendly and helpful (in the simple task of finding a circular). Old and new price signs right next to each other. Both of these prices are rather high. 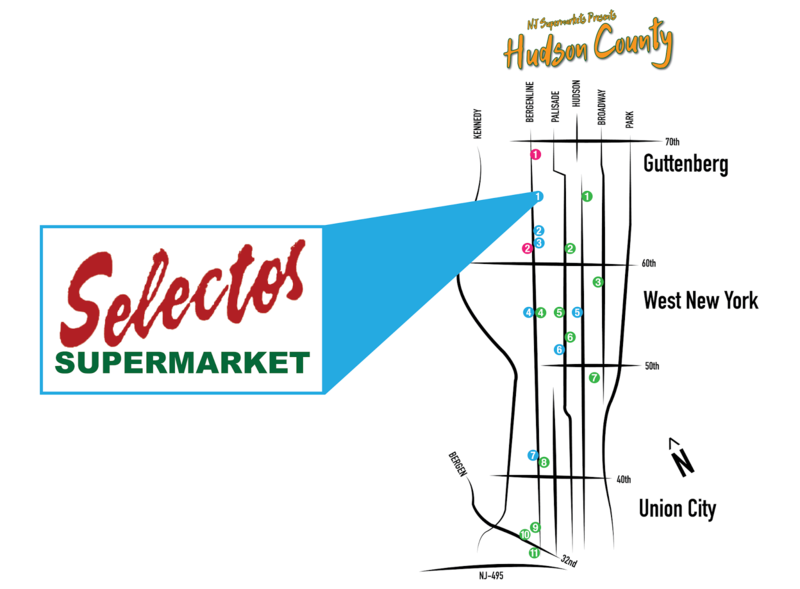 It mostly gets better from here, so stay tuned for a Snapshot on Wednesday of the next store, Selectos of West New York! Former Supermarket of the Month! February's Former Supermarket of the Month is this store in Livingston, NJ. It was built as a Grand Union but bought by Pathmark in the 2001 bankruptcy. 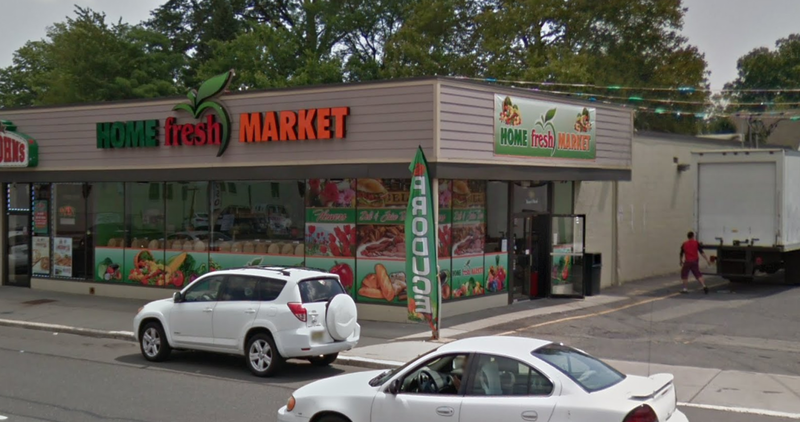 Pathmark closed in 2010 and The Fresh Market opened up in the space in 2014 (?). It closed in 2017. 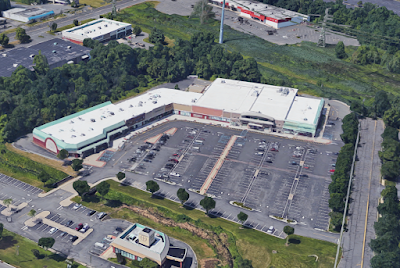 Other supermarket operators have not been interested in the space because of its out-of-the-way location and the fact that no fewer than three different major chains closed here. 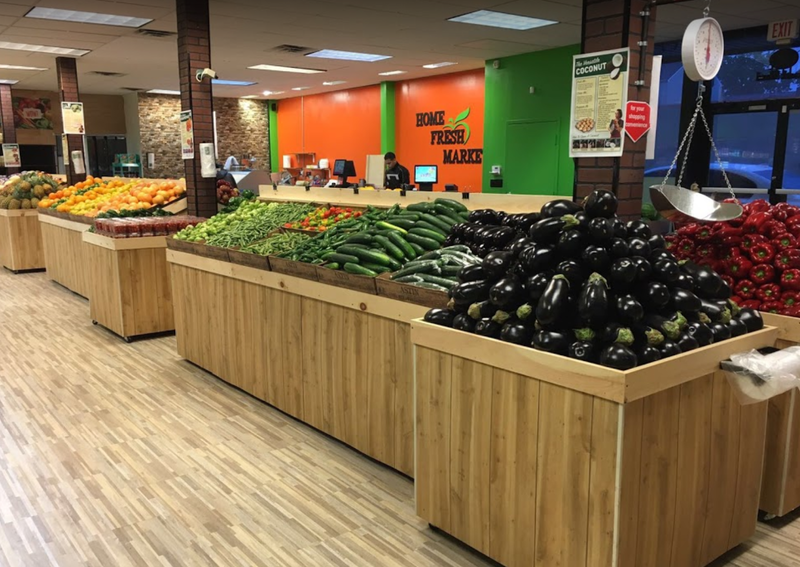 The Fresh Market took up a roughly 25,000-square-foot space in the right half of the former Pathmark. This entire strip, despite the recent renovations, has had difficulty in finding and keeping tenants. Although one supermarket was rumored to be considering the space, there has been no action on that. Last August, I took a full day to walk around Union City and West New York, NJ (and one stop in tiny Guttenberg), in Hudson County just north of Jersey City. That area is practically overflowing with corner stores, bodegas, super carnicerias, neighborhood markets, and supermarkets. Bergenline Avenue, especially in West New York, is a very pleasant*, vibrant pedestrian-based business district. We're going to take an in-depth look at 20 stores in those two cities over the course of the next month or so. There will be eleven full Store Tours and the remaining nine will be either Snapshots or Look Inside posts. Here's a look at what you can expect over the coming weeks. *Er...it's pleasant when it's not 95 degrees out. Like it was on the day I chose to do a walking tour of these 20 stores. Definitely click on the picture to zoom in. We'll be touring them approximately from top to bottom (not quite north to south, more like northeast to southwest). 20 stores at three a week means that it will take us about a month and a half to get through all this, or 2/26/18 through 4/11/18. So check back often! This region's super-local (and pleasantly ungentrified) neighborhoods with very few people who drive means that all these small, locally-focused stores can coexist even so close to each other. There are a few clear larger stores that are central destinations, including some that I did not visit, which tend to be more suburban style, with parking lots. Immediately to the east of this area is the NJ coast that borders New York City, which has become a center for very upscale residential developments. Weehawken, which is just east of where the compass approximately is, has a ferry to Manhattan. The local supermarket joke is that the six inches along the coastline of West New York shop at the Acme at Port Imperial and the rest of WNY shops in Food Bazaar. Moving north, and away from Jersey City, Bergenline Avenue emerges as a major business corridor. 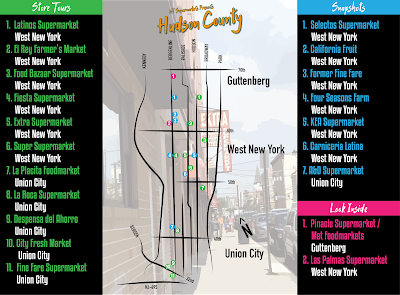 While the section between about 45th and 55th Streets has many large chain stores, they give way to smaller local businesses -- including literally dozens of restaurants -- above that area, with the main center of town in West New York around 60th Street. 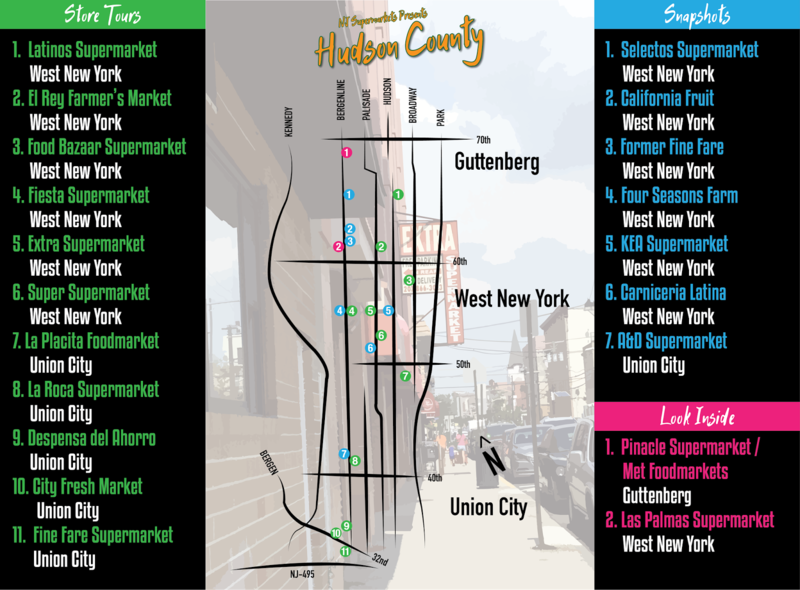 To the north, Bergenline continues through Guttenberg and North Bergen before changing to Anderson Avenue in Fairview, on which the Fairview Food Bazaar is located. To the south, Bergenline ends at Washington Park, a large municipal park, around 2nd Street in Union City. The Jersey City border is a few blocks below that. If you've ever taken the Lincoln Tunnel into New York City, you've driven straight through this neighborhood. NJ-495, labeled on the map above, is the main highway going to the tunnel and unfortunately divided Union City when it was built. We're focusing only on the north side here. For people who don't drive, the highway is extremely difficult -- not to mention unpleasant -- to cross. However, supermarkets on both sides offer free delivery. Union City is (percentage-wise) the most densely Hispanic city in the state of New Jersey, with just shy of 85% of the population being Hispanic. It's also the most densely-populated city (50,000+ people) in the country! West New York is a smaller town, with roughly 50,000 people to Union City's roughly 65,000. It's 78% Hispanic, but diverse enough that you can find plenty of international dining options on Bergenline. Guttenberg is comparatively tiny: the ninth-smallest municipality in the state, it's amazingly the most densely-populated municipality in the country. It's also the 19th most densely populated in the world. Guttenberg manages to pack in over 11,000 people -- and just one supermarket -- in roughly a quarter of a square mile. Guttenberg is about 65% Hispanic, and about 20% of the population lives in the Galaxy Towers, a trio of apartment buildings on the coast. 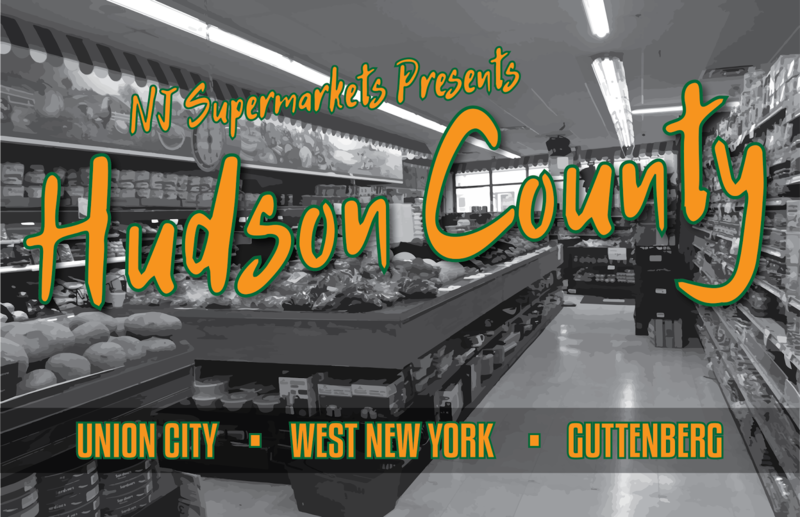 Hopefully that gives everyone who's not familiar with the area a look at what the cities are like, and it will help everyone better understand the supermarkets when we see them, starting on Monday with the only supermarket in Guttenberg, the Pinacle Supermarket! PLUS...the last post of the series will have a special surprise, especially for anyone who's interested in supermarket history! Few grocery chains scream "on their way out" like Met Foods does. Most Met stores are outdated, cramped, and haphazardly run. However, this Food Connection Supermarket on Staten Island, which does business as a Met Foods with ASG, was a very pleasant surprise. It's an old-fashioned grocery store with a storefront facing the main street, Victory Blvd, and parking and the main entrance in the back. This is the back entrance, which directs shoppers into the produce aisle, along the back of the store. Surprisingly, this tiny store even had a large seafood department, organic produce, fresh bread from local bakeries, and a large gourmet deli. 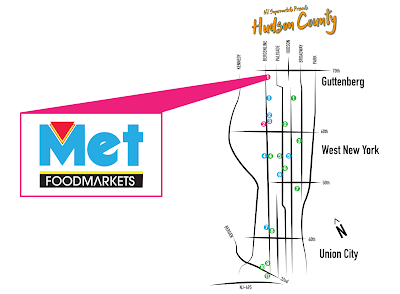 Food Connection owns both of the Met Foodmarkets on Staten Island. 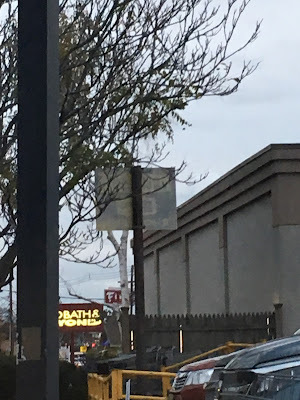 One of the few remaining, largely unaltered Marina Safeways in the country is in the unlikely location of Springfield, NJ, just across the street from the former A&Ps we saw on Friday. It's owned and operated by Village Super Market, which is also based in Springfield. The storefront is completely glass, save for expansions to the two sides. The produce/grand aisle with deli, a tiny bakery, and seafood is to the right, and the pharmacy (formerly a liquor store) is on the left side. The worst thing about this store is its parking lot, which is not nearly big enough for the traffic that comes through this store. Old sign in the corner of the lot. Hard to tell exactly what it says. Great sky. These last two pictures were taken from the parking lot across the street. 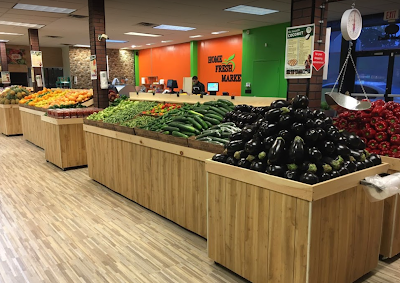 This is a very new store that only opened in May of 2017 and looks really nice: Home Fresh Market in Linden, NJ. Located at 355 St Georges Ave, it sells a selection of fresh produce and has a small deli. Home Fresh posted the above photo on Google Maps as well. Look at that eggplant! You really can't miss that A&P facade. The left side of the store has been turned into a Panera restaurant. A shopping mall with offices on the second floor extends out of the side of the old A&P building, with a facade that replicates the A&P building style. Here we're looking from the older A&P, in the foreground, towards the newer one in the background. The 1970s building, with a new facade, has become a CanDo Fitness Center. You can see the store would have originally had a Centennial-like facade, but later tenants added the new facade in front. An overview of the whole plaza. The Springfield ShopRite, which we'll see a Snapshot of on Monday, is located directly across the street. 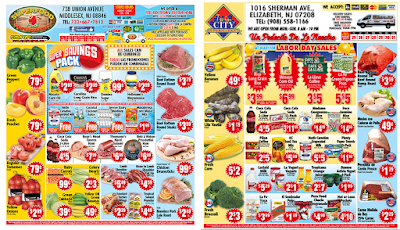 We saw the Super Foodtown of Lake Hiawatha in Parsippany, NJ over a year ago, a converted Grand Union that closed in the 2001 bankruptcy and was taken over by the LaRacca brothers, who had a small chain of stores under the Foodtown group. Today it's their only store. However, that Grand Union was likely renovated and expanded to coincide with the closing of their other store in Parsippany, this location on Littleton Rd. Today the building has been divided among several smaller stores, including Dunkin' Donuts, Subzi Mandi (an Indian grocery store), Chand Palace, and Pearl Banquet Hall. Subzi Mandi always has a random assortment of shopping carts, many retired from the nearby ShopRite. Many supermarkets reuse old carts from other stores. Some stores have their own fleet of ancient carts. For once, a supermarket commercial that's pretty good! When you own a supermarket, the first impression of the store that your customers -- and prospective customers -- get is the outside, right? So the outside should draw customers in, in one way or another. It should never leave your customers wondering what the heck your store's name is. This photo was taken in November 2016 at the America's Food Basket (formerly known as Compare Foods) in Providence, RI. Click here for a full tour. Hmm. 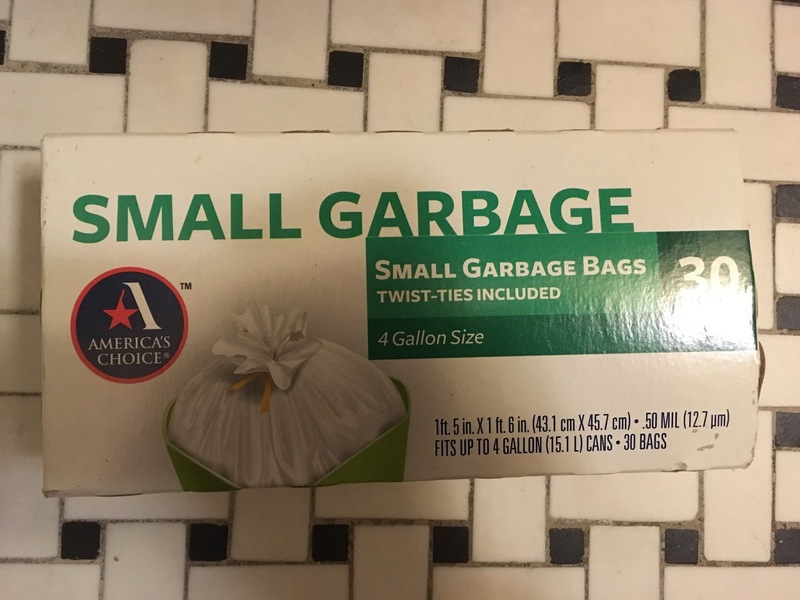 Somehow the idea of buying "small garbage" isn't overly appealing to me. Maybe it's just me. 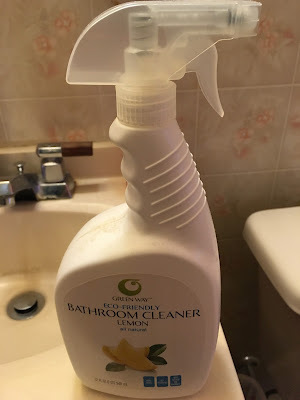 Of course, Greenway products are now available at Foodtown and other Allegiance affiliates. But they're not the original ones distributed by OnPoint, Inc at 1 Paragon Dr in Montvale, NJ! And this store, Superfood Fresh Market in Middlesex, NJ. This store has an interesting history. The store was opened as a WT Grant in the 1950s, joining an A&P at the other end of the mall. A&P closed in 2001 and was converted to a Food Basics, which closed in 2006. That space is now divided between Dollar Tree and the Route 28 Farmers Market, a small greengrocer. WT Grant closed in the 1980s and was replaced with a Drug Fair. Drug Fair, in turn, closed in 2009 and was replaced by Walgreens, which found it hard to fill the entire 30,000-square-foot space. So they blocked off a portion of the store and used it for storage. Photo is from JoshAustin610's Flickr. 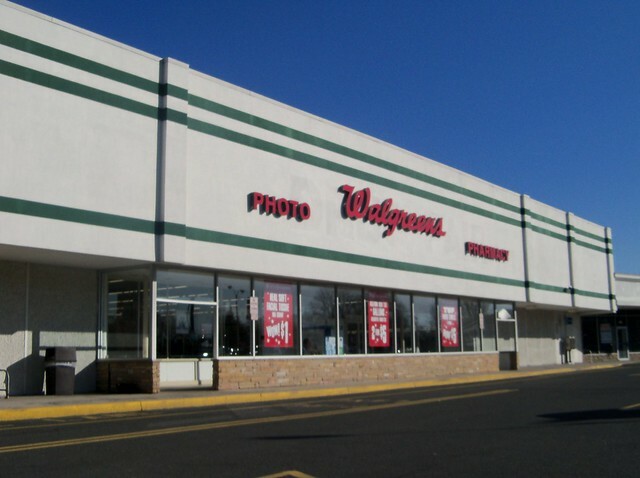 Walgreens closed in 2015 and was replaced shortly thereafter by the third location of Superfood Marketplace, a joint venture between Ana Lemes and Miguel Martinez, independent supermarket owners, and the Twin City owners. This Middlesex Superfood joined locations in Elizabeth and Allentown. However, it appears that soon after opening, this store was spun off as a Twin City affiliate and is now called Superfood Fresh Supermarket. The storefront is very nice. The walkway along the front goes behind the windows, and there is no door to get into the walkway on either side; it's just an enclosed walkway. The doors take you into the store, where you enter the produce aisle, with dairy along the back wall, and meat/seafood/deli in the last aisle, just like Twin City in Elizabeth. Someone has diligently applied Superfood Fresh Supermarket stickers over the Superfood Marketplace logo on every single cart, on both sides. This store is obviously nicer than Twin City in Elizabeth, and smaller, but it still feels spacious. You can see the entrance to the right above. This corner is the beginning of the produce department, which extends down the first aisle. All of those banners used to have the Superfood Marketplace logo, and they now have the Superfood Fresh logo. I wonder why they didn't just go ahead and call it Twin City. Simple but attractive decor and fixtures. The produce in this store was great. Because the store was not previously a supermarket, all the fixtures are brand-new. I think I probably would have done something better with the aisle markers, but it works. Superfood Fresh is serviced by the Twin City warehouse in Elizabeth and by extension General Trading of Carlstadt, NJ. 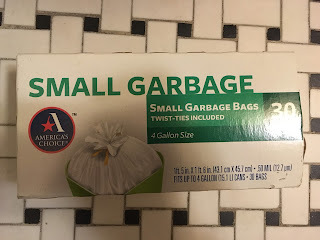 Their storebrand is Parade. The flooring is really nice. It's that new tile that's made to look like wood. A look down the back aisle towards the produce department. Looking along the back aisle in the other direction towards seafood. The freezer aisle is the second-to-last and is a double-wide aisle. There's lower shelving down the middle of the aisle. Packaged meat lines the other side of these cases, with service meat, seafood, and deli on the far wall. There's a small corner in the front with baked goods, but there's no in-store bakery. Meat, looking towards the back wall. Meat and deli looking towards the baked goods area in the front corner. There was, however, a great selection of rolls from a local bakery. Looking along the front-end from the bakery. Here we're looking along the front-end from the entrance. You can see that the circular for this Superfood has more in common with the Twin City circular than the Superfood circular! 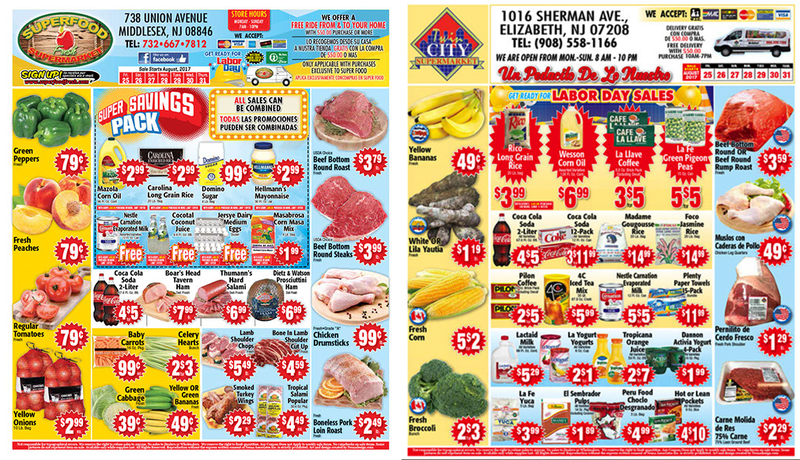 Top left, Superfood Fresh in Middlesex (this store); top right, Twin City in Elizabeth; bottom, Superfood Marketplace in Elizabeth. 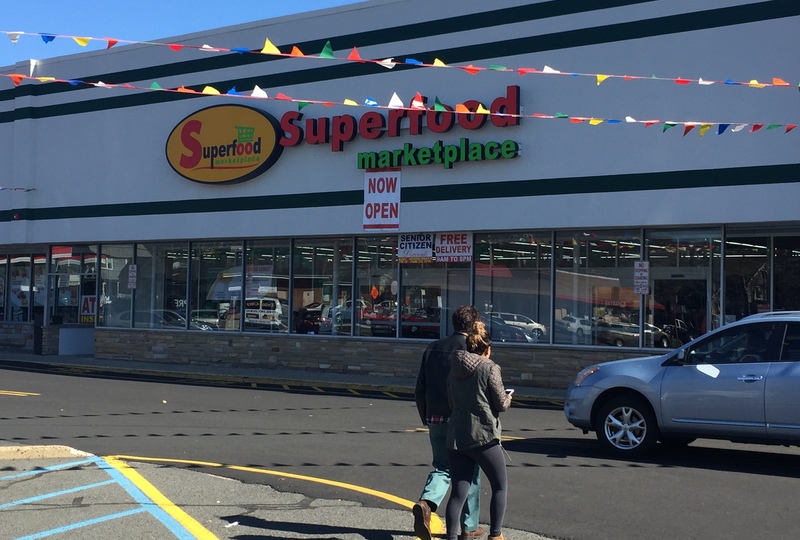 This Superfood is a very nice store, and it's a good use of a former drugstore, especially since the Pathmark in town is out of business with no replacement yet.